Derk is quoting Beaker in that first panel. Bittersweetness is better than all-out sadness. We promise comics will be funny again soon but after all, this is a story and life isn’t all rainbows and butterflies, not even for My Little Ponies, man. Well, the sooner the better I suppose (although obviously not right off the bat), the better to signal that there WILL be bittersweet parts to this story in the future; rather than have it be purely funny and silly for a very long time and then out of the blue WHAM that was intense. Don’t worry, this won’t last very long though. another thing, what did he do to derk? Oh dear, Random, what is wrong with you! :O Blank is a good kid, he may solve things with violence but he would never do THAT. Derk is simply frightened of him, after seeing him make quick work of his beloved boss, that’s all. Hehe, Derk going all like ‘meep’ made me laugh… and…. you do realize I simply outright ADORE bittersweet, heartwarming stuff anywhere, right? I’m so glad this comic has some emotional parts as well because, yeah. It’s awesome so far, keep it up! This is my favorite page now! Drama done well does right by a comic. Well done! Tropers! Does anyone else think this “Aww, Look! They Really Do Love Each Other!” applies here? Yay! I’m so glad to hear it. Hmmm. Perhaps, although I took a look at that trope and it seems to really suggest a romantic relationship, I suppose not necessarily, but that’s more of the idea. Also, Skärva and Lori have known each other for like… a day, so this isn’t a long-secret affection showing itself so much as the moment when they truly bond. Although that page did lead me to this one which seems perfect for Derk and Lorelei. Huh, most of the ALTRDLEO instances I’ve seen deal with familial love. And if that’s the way you see Skarva and Lor, I can wait all the less to read more! But of course, the decision is up to you and anyone else who cares, because the tropes page is something that me and Victor enjoy following, but we’re never going to mess with ourselves. It’s been fun seeing what observers might pick up in the comic, because a lot of the things on there, I didn’t even know were tropes (we’re definitely not as in-the-know as you. :P). 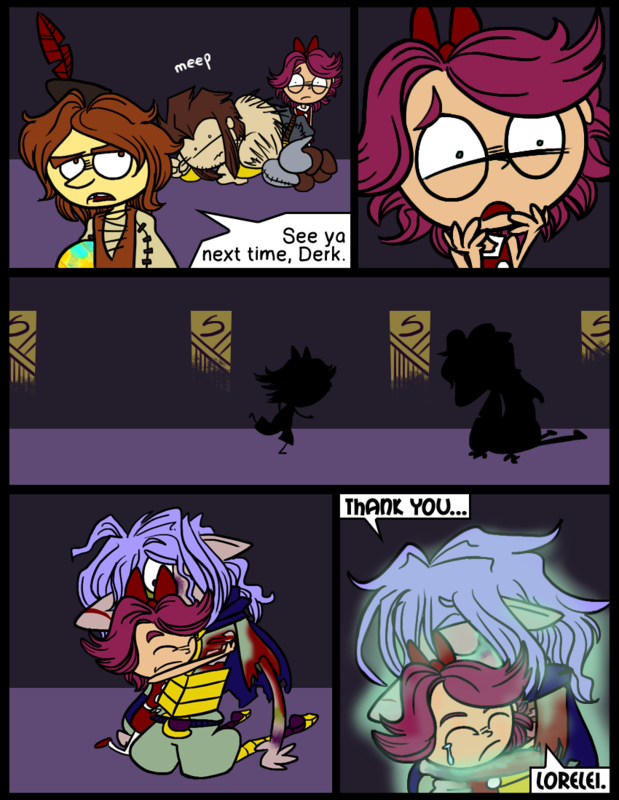 Also, methinks Derk needs a hug. Oh man, I nearly burst out laughing in class, imagining the end of this comic seguing into Skärva and Derk floating down in a hot air balloon and the My Little Pony theme starting up. And then them meeting up with Lorelei on the ground. I thought Derk was a good analogy for Spike because he’s always doing all the crap and not getting any respect. I hope it didn’t melt you too much. We like having you around. Thank you! Yeah, I could pull off fire like that. Hey, are you still traveling? What are you doing exactly? I saved up part of my salary for a time, then quit to come out here and travel; once the money runs low (as seems close to happening), I’m hoping to get work in England (I thankfully have a British passport due to my dad being British). Thankfully WiFi seems to be fairly easy to come by (I seem to generally be able to find a decent hostel that offers it), and although not all connections are wonderful (this current one seems to have a tendency to disappear every so often, for example) I think that I’ve had fairly little trouble, I’m glad to say. Wow! Well, in the midst of all your adventures, I’m glad you’re taking the time to read our comic. Do you have Skype or something? I’d love to talk with you more but this doesn’t really seem the appropriate place to do it. I do, but I’m afraid that I’m not often online on Skype (which has little to do with my travels, I fear); how would email work for you? If you have access to the email address that I use when posting these comments, then feel free to contact me via it; if not, then let me know and I can post it here (with slight obfuscation to keep the spambots at bay, of course). dont worry miss,I have an icecube tray or tw,ill be fine,but be more careful next time,Im course,dont matter to much to me,but all this slushy stuff its snowdrifting away from the comedy,granted that thats not a bad thing at all,yeah,had to work in an ice pun Ideneu why. I *love* this! And I know I say that about all of your pages, but really, this one is so sad/sweet, I just love it. these pages always make me want to cry =( So cute and so sad.